E piʻi aku i ke ala ʻūlili! Join us on this journey up the steep trails of our kulāiwi on the slopes of Maunakea! Beginning at the kahakai, click on the wao delineated in picture below to experience the various places and challenges that we will encounter along this journey. s. Wao, place, and akua, gods; region of the gods. The kuahiwi is the highest, most sacred region of the wao akua, where few had kuleana to enter, primarily for ceremonial purposes. The kuahea, kuamauna and kualono are characterized by groves of māmāne, pukiawe, naʻenaʻe, ʻāhinahina, and ʻōhelo, in dunes where many of our kūpuna were interred. The wao lāʻau and wao nahele are the upper regions of the mountain forests, dominated primarily by koa, māmane, ʻiliahi, ʻākala, and hāpuʻu. The wao maʻukele is the most densely forested and heavily watered region on the mauna, covered primarily in ʻōhiʻa lehua, kōpiko, koa, olopua, and hāpuʻu. The kula region in the wao kanaka is the realm where people lived and cultivated the ʻāina, which was interspersed with groves of kukui and hala. The kahakai, or coastal region in this area is rugged, where skilled fisher people descended steep cliffs to access the ocean. 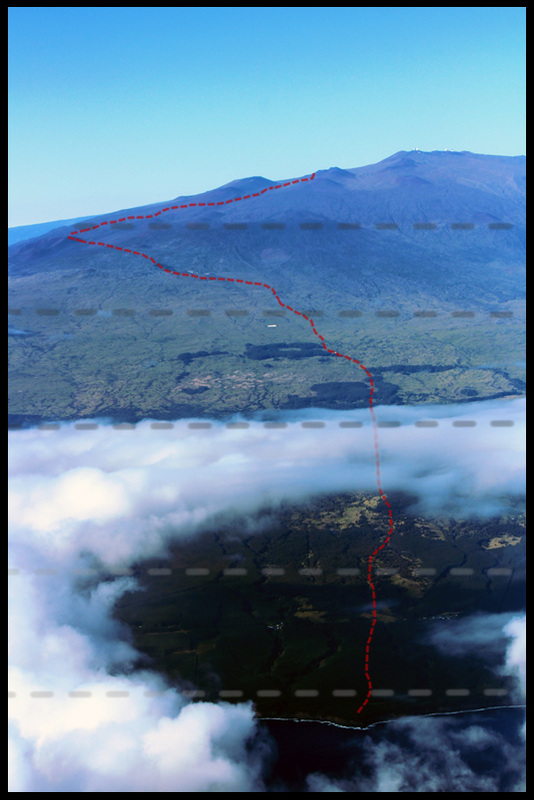 Historically, this sacred summit region was accessed by ʻŌiwi when necessary for spiritual and cultural practices, by means of a few trails which connected the district’s coastal communities to its upland slopes on Mauna a Wākea. These long, steep trails are the reason why this region of Hāmākua is noted as “Hāmākua i ke ala ʻūlili” (Hāmākua of the steep trails) (Pukui 1983, 53). Among a number of ceremonial and subsistence purposes, this trail was primarily utilized to access the mountain’s adze quarry at Keanakākoʻi, to gather important hardwoods and grasses, to hunt valuable meat birds, to deposit the piko of newborns, and to inter the deceased. Photo & Graphics by huiMAU. (c) 2012.